The Rollins in Shanghai program, offered through the Alliance on Global Education, introduces students to China and its complex language and culture. Sample some of China's delicious street food! 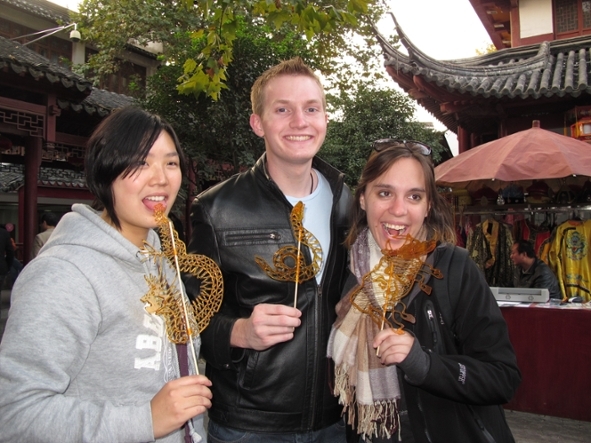 The Rollins in Shanghai program offers students the unparalleled opportunity to study Chinese language, Chinese culture, Asian studies, Global Health, International Business, International Relations, Sociology, Urban Planning, and Economics. Students live with Chinese roommates and participate in program activities and excursions that provide a first-hand encounter with China’s rapidly changing environments. This program is only offered in the fall. Some majors have specific course pre-requisites for the internship; contact your faculty advisor or International Programs for more information. Students are responsible for booking their own flights. Round-trip airfare from Orlando is estimated at $1600. Alliance will provide students with specific arrival information so that students can take advantage of the arranged airport pick-up. Rollins students will participate in a two or three day orientation with other Alliance program participants that includes: an introduction to the program, meeting your Chinese language and area studies professors, an overview of the academic program and expectations, a Chinese language placement test for students who have previously studied Chinese, information about program policies (academic, student conduct), health, safety and security tips and information, individual meetings with your Resident Director, information about experiencing and coping with cultural shock, tours of the campus, neighborhood and city; a cultural performance, and a meeting with your Chinese roommates and language partners. A visa is required for US citizens. Alliance will provide students with instructions for the visa process, which is generally done through a visa processing agent. For more information about the visa process and visas for non-US citizens, see our Passports and Visas Page. The Shanghai University of Finance and Economics (SUFE), founded in 1917, is a top-ranked, world-renowned research university, with a core focus on applied economics and management and offering majors in law, philosophy, as well as humanities. SUFE, home to 24,000 students on two campuses, has recently been selected as one of the "21st Century's Key Universities in China." It is the number one ranked finance and economics university in China. The program uses classrooms at SUFE and students have access to the campus facilities and services. The courses are not SUFE courses but rather these are designed for the students in the abroad program. Chinese language courses are held near the Alliance office, rather than on the SUFE campus. Chinese Language Courses: In general, students will take 6 credits of Chinese language on this program. However, students with no background in Chinese language may opt to take a less-intensive Chinese language course for 4 credits. Those doing the public health track will take the 4 credit course. Students may also opt to do the Chinese language intensive program, which requires two prior semesters of Chinese and is an entirely language-focused program (students must sign a language pledge to only use Chinese during the time abroad). SOCI 260: Chinese Society in the 21st Century: Asian studies track course. This course is linked to an extended field study trip to either Yunnan or Qinghai province. PUBH 315/POLS 315: Public Health Policy and Practice in China: Public health track course. Students will then choose their additional courses from the array of other Alliance courses. See below for links to course titles, descriptions and full syllabi. All courses are three credits; however, INB majors who wish to enroll in the internship for major credit may opt to do a 4-credit internship. Students on the program will take Chinese language, one of the two Alliance core courses, and at least one other Alliance courses for a total of 12-17 credits. IP recommend that students interested in and qualified for the internship course take a lower number of total credits in order to accommodate the hours spent at and commuting to/from the internship site. Courses taught by Rollins faculty members are Rollins courses and will appear on the Rollins transcript as such. Chinese language, content and internship courses taught through Alliance will be transcripted through Butler University. Students participating on this program will need to seek the appropriate departmental approval for all major/minor requirements and approval for General Education Requirements through Student Records. All courses on this program appear on the Rollins transcript as transfer credits and the grades are factored into the Rollins GPA. Students who successfully complete this program through Rollins will receive an official transcript from Butler University. It can take up to 3 months to receive the official transcript. Alliance Shanghai staff includes a Resident Director, Student Services Manager and Program Assistant-plus a Language Director and several language instructors- all based at their Program Center. Program faculty come from various universities across Shanghai to teach exclusively for Alliance students. Student support and program logistics are organized by Alliance staff members, who are available to assist with any student issues or concerns on-site. Students will live in newly renovated international student dorms on SUFE's campus which is 15 minutes walking distance from the IFSA Shanghai office (located in the Tonghe Student Village) and SUFE campus classrooms. Each student will live in a shared apartment with other international students and will have a private bedroom. Each apartment includes two bathrooms, a living room, a kitchen, and four furnished bedrooms with a desk, closet space, and a remote control heating/air-conditioning unit. The bedrooms also include sheets, pillows, and a comforter. Towels are not provided. The furnished common areas include table and chairs, and a refrigerator. There is a public laundry room with washers and dryers in a nearby building. Please note that no kitchen utensils or other supplies are provided. Internet is available in each apartment for purchase based on usage. There is no meal plan provided on this program. Students can choose to cook meals in the apartment kitchens or eat out. There are a variety of inexpensive restaurants near the housing, including some just outside the housing complex. There are also Western style restaurants and bars in just a 10-15 minute walk from the housing. As part of the orientation program, students are introduced to some of the local restaurants and learn how to order in a Chinese restaurant (including key terms for reading menus!). The Rollins in Shanghai program includes an option to join one of the two nine-day excursions offered by Alliance. One excursion (for students taking the business/economics core course) is to Guangdong province, Hong Kong and Macau. The other excursion (geared towards students taking the Chinese society core course) may vary year to year but usually includes Yunnan or Qinghai province with the aim of exposing students to China’s social, economic, and geographic diversity. In addition, Rollins students also enjoy one weekend excursion. Past destinations include Shaoxing, Xinchang and Hangzhou, Suzhou and Nanjing, and Xian. There is at least one full-day excursion as well (for example to a nearby water town). Cultural activities during the semester may include visits to Yuyuan Gardens, a guided tour of the Propaganda Poster Art Centre, a Huangpu river cruise, a walking tour of the Bund, etc. During the week, the Alliance arranges extra-curricular classes which may include Chinese painting, calligraphy, cooking, Taiji or other martial arts, seal carving, or paper cutting. Alliance also organizes special lectures on a range of topics. Past examples include “Adapting to China’s Business and Financial Practices” and “Art, Economics, and Shanghai’s Urban Redevelopment Politics”. Company visits during the semester for Business students may include Baosteel, textiles factories in Shaoxing City, and the Sigma Group. Other potential field visits may include cultural performances, museum visits, special lectures, visits to artists' studios, architectural walking tours, and many opportunities to meet locals, including students from other campuses. Students have access to all SUFE campus activities and student organizations and are encouraged to get involved. The Chinese roommates and the Alliance Resident Director can help students find out about activities and clubs. Tuition and administration, visa, housing, airport pickup, internet access, Chinese language books, cell phone, full medical and emergency insurance, orientation, and excursions and activities.